It was King Béla IV who decided to build a fortress here in order to protect Buda from the Mongols, however the castle owes its opulence to the Habsburgs. Location: 1014 Budapest, Szent György tér 2. It was King Béla IV who decided to build a fortress here in order to protect Buda from the Mongols, however the castle owes its opulence to the Habsburgs. Outside the palace note the huge turul; the equestrian statue of Eugene of Savoy; King Mathias's fountain; the Lions' Gate, leading to the beautiful interior courtyard; the "war hammer" tower; and the barbican. 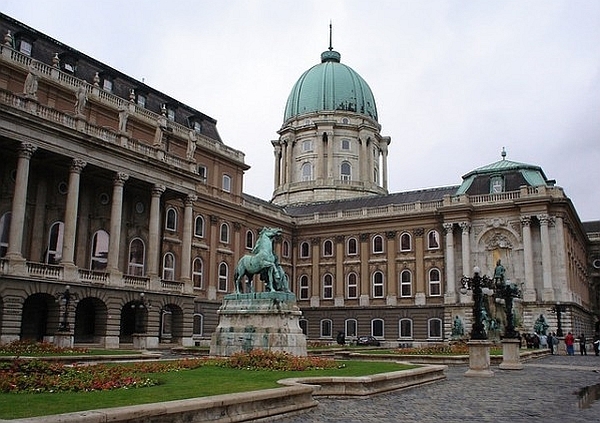 The palace houses the Széchenyi national library, the Budapest History Museum and the Hungarian National Gallery. Did you like Royal Palace? Please share your opinion below or rate it at the top! Have you got any Budapest or Royal Palace related question? Please have a look at our Questions & Answers section! There is an easy way how to link to our Budapest guide & maps about Royal Palace, ready to use on your website. Simply copy & paste the HTML code below into your page source code. Thank you for all links to Budapest travel guide! Castle Hill Surrounded by ramparts, Castle Hill overlooks the Danube. Gresham Palace An example of the Art nouveau style in Budapest.